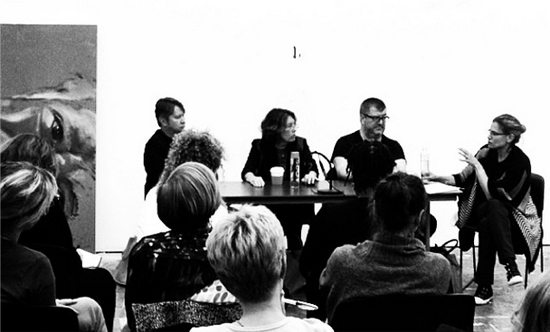 The NYAA Professional Practice Lecture Series consists of casual conversations designed to provide students with professional advice from experts in the art world and beyond who share information on many different topics. In 2009, Senior Critic, Sharon Louden, was invited to assume the production and organization of the series, and she has been moderating panels and interviewing participating guests ever since. These one-and-a-half hour long conversations are recorded, free, and open to all who wish to attend, providing tools that inspire and help NYAA graduate students, alumni, and the interested public to prosper in the art world and other related areas. The content shared with live audiences reveals extremely useful information not readily accessible in other formats (classrooms, press, online, etc.). The "talk show"-like style is casual and relaxed, if often lively, rigorous, and sometimes controversial. After engaging with and directing panelists for approximately 45 minutes, Sharon opens up the discussion to audience members so that they may ask questions and participate in the dialogue. Finally, attendees are encouraged to meet the panelists at the conclusion of the discussion. Past luminaries who have participated include: Randy Cohen, Deana Haggag, Robert Storr, Hrag Vartanian, Andrianna Campbell, Jillian Steinhauer, Andrew Russeth, Ken Johnson, Carter Foster, Roberta Smith, Jerry Saltz, Caroline Woolard, Jessica Lynne, Paddy Johnson and Laura Hoptman, to name only a few. The program is widely advertised to students and the general public, and each panel is recorded on video. With over 50 videos now accessible for free online, the series has become a wealth of information that is being integrated into curricula at art schools across the country. To view videos of past conversations, please visit NYAA's Vimeo Channel. Steven Henry, Director, Paula Cooper Gallery: "A Conversation with Steven Henry"
Laura Hoptman, Curator, Museum of Modern Art: "Working with Museums - Meet the Curator"
Paul Laster, artist, writer, editor, independent curator, and lecturer; Deborah Solomon, art critic, journalist and biographer; and Christian Viveros-Faune, writer and curator: "A Conversation with the Critics"
Roberta Smith, The New York Times Art Critic: "Art Criticism Today"
Hrag Vartanian, Christopher Howard, and Lilly Wei, "Talk to the Critics"
Jonathan T.D. Neil, Director of the Sotheby's Institute of Art, Los Angeles: "The Value of Art"
Don Kimes, Professor of Art, American University, Washington, DC, and Artistic Director in the Visual Arts, Chautauqua Institution, Chautauqua, NY: "Pedagogical Issues, Teaching Art, and Teaching Positions for Artists"
Robert Storr: "A Talk With Robert Storr"
Adam Sheffer, Partner, Cheim and Read Gallery, NYC: "Galleries, Art World"
Dede Young, Gallery Director, Gallerie LeLong: "Working With a Gallery"
Walter Robinson, Artist and Former Editor of Artnet.com: "Reviews and the Critic"
Michael Straus, Collector and Chairman of the Board, Andy Warhol Foundation: "Collecting"
Anne Pasternak, Director, Creative Time: "Alternative Projects"
Austin Thomas, Artist & Curator: "Pop-ups and Curating"